Image 1: Achillea millefolium in flower. If you look closely, you'll notice that each flower is actually a compound of smaller flowers; this is a characteristic of Asteraceae family members like the dandelion and the sunflower. Taken by the author: Kevin Healey. To tell the near-full story of Achillea millefolium in a single article, you need to be delusional enough to believe that you have the ability to cram an entire universe into a tiny box. Yes, delusional! You must lie to yourself in the mirror: "you are a good writer; everybody cares about yarrow; you are not wasting your time." Well, these lies turned into action. Out of all plants of the world, yarrow's roots penetrate into some of the deepest and darkest reaches of the human experience. Yarrow has found fertile ground in ancient faiths, folklore, alchemical oils, divination, mythology, warfare, poetry, beer-brewing, and aesthetic appreciation. Yarrow may even tell you if that shady boyfriend of yours, Duncan, has been two-timing on you or not. Listen up, Vanessa! Remember, this is an Old World/introduced herb, but it is also one of the most widely used plant medicines by Native Americans. There were a total of 377 logged uses for Achillea millefolium and its variants according to Daniel Moerman's epic reference omnibus, Native American Ethnobotany. This is outstanding compared with most other plants. With a will to follow your imagination, yarrow can lead you to some of the world's most incredible literary achievements, or inspire you to concoct a warming soup to show the one you love that you care for them deeply and want them to be healthy. So, buckle your seatbelts, Vanessas; we are all going on a strange trip in my rusty time machine... no it is NOT a van. Welcome to the heartwarming, blood staunching, and superstitiously delicious world of Achillea millefolium: yarrow. You don’t need to be an expert on all wild plants to start foraging your food and "medicine;" you only need to be an expert on the plant you are going to use or consume. You’ve got one job: be certain. Any doubt is a warning to yourself… listen. Family Characteristics — Asteraceae (Sunflower) family members have composite flowers (i.e. flowers appear to be single flowers but are actually composed of numerous smaller flowers) . Blood staunch, bloodwort, cammock, carpenter's grass, carpenter's weed, common milfoil, devil's nettle, dog daisy, gearwe, gordaldo, gordolobo, green arrow, meleflower, merefow, milfoil, nosebleed, old-man's pepper, sanguinary, sneezeweed, soldier's woundwort, staunch grass, thousand-leaf clover, yarrow, yarroway. It was brought to my attention that I should mention a couple of deadly lookalikes to A. millefolium by the good people of Reddit (r/Survival) at the top of this article. Meet Conium maculatum, or, POISON HEMLOCK. Poison Hemlock and other "hemlocks" in the Cicuta genus will kill you if you ingest them (look-up Cicuta bulbifera L., Cicuta douglasii (DC.) Coult. & Rose, Cicuta maculata L., and Cicuta virosa L.) . There are are a few ways of ensuring that you have yarrow, however, if you are a kid, you need to have an expert carefully introduce yarrow to you. Remember: a great way to introduce yourself to a new plant— especially one with deadly-poisonous lookalikes— is to buy some seeds or plants from a reputable vendor and grow them at home first. Yarrow has feather-like/highly dissected leaves (see description). Yarrow DOES NOT have fern-like leaves as seen above. Yarrow DOES NOT have a chambered/tuberous root. Yarrow DOES NOT have pinnate or pinnately-compound leaves. Yarrow will NOT exceed 1-2 feet in height. Binomial Etymology— Achillea- referes to Achilles: the legendary warrior in Greek mythology who was featured prominently in Homer's Iliad which covered the Trojan war; mille- is derived from Latin and means "one thousand," while, -folium (also derived from Latin) means "a leaf" . So we can take the entire binomial to loosely mean: Achilles one-thousand leaves. Flowers may present with various colors, however, most wild yarrow flowers appear to be white. The leaves are oblong to lance-shaped and are finely dissected (see image below), and occur alternately upon the erect stalk (which may be either simple or branched) getting smaller the closer they get to the flower head . Numerous compound flowers present together as an umbel . The plant has a characteristic odor when rubbed in-between the fingers. Image retrieved under Creative Commons licensure from this link. Yarrow has been used as a bittering agent in place of hops in brewing beer ; this use was once thought to intensify the inebriating quality of the beer itself . Personally, I've used yarrow as a tea, and a spice with wild onion and butter to cook porcini in the mountains. NOTHING can beat that experience. Also— and I'm not sure why the whole world doesn't do this too— I've added yarrow to chicken noodle soup to help with a cold, and it did everything right for the flavor. Give it a shot! This recipe is for a yarrow infused chicken broth to help someone who has a bit of a cold. Combine all ingredients and water into a boiling pot. Cover and simmer gently for 3 hours (watching the water does not completely evaporate). Bring water up to original volume. Strain (conserving chicken meat for soup as needed). One of the remarkable things about yarrow: even though it is an Old World/introduced species to the Americas, it has been a plant of great use to NATIVE AMERICANS. Figure 1, below, is a graphic representation of the number of cited uses of yarrow among various Native American groups in the literature (at least up to 2010). 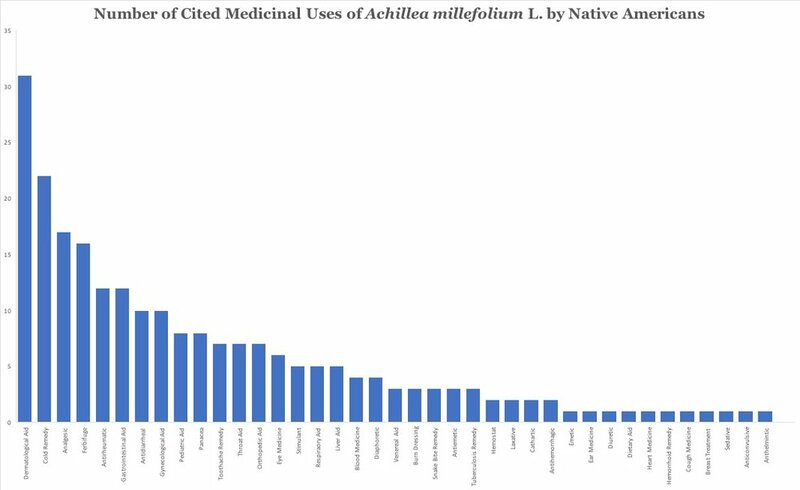 Figure 1: Number of Cited Medicinal Uses for A. millefolium L. By Native Americans. This data was mined from Daniel Moerman's indispensable reference text and database, Native American Ethnobotany. Given the diversity of uses for this plant across the globe, this article will focus on the three most common: yarrow's utilization as a dermatological aid, cold remedy, and analgesic (pain killing) medicine. BLACKFOOT (infusion applied to sores), CARRIER (poultice applied to swellings), CHEROKEE (leaves applied to stop hemorrhaging), BELLA COOLA (heated leaves applied to boils), CHIPPEWA (decoction applied to skin eruptions), COWLITZ (infusion used as hair wash), CROW (poultice used for open sores and lesions), FLATHEAD (crushed leaves used on wounds), GOSIUTE (poultice applied to bruises), KAROK (poultice of stalks and leaves applied to wounds), KLALLAM (poultice applied to sores), KUTENAI (decoction for cleaning wounds/skin problems), KUTENAI (leaves cursed and applied to wounds), KWAKIUTL (poultice applied to sores and swellings), LAKOTA (poultice applied to wounds and sores), MALECITE (liniment applied to bruises), MENDOCINO (infusion infusion of leaves/flowers as wash for bruises), MENOMINEE (poultice of dried powdered herb applied to sores and swellings), MENOMINEE (poultice for children's rashes and eczema), MICMAC (powdered bark and leaves used as a poultice for bruises), OKANAGAN-COLVILLE (decoction used for pimples, hand chapping, rashes and insect bites; used as shampoo ingredient), PAIUTE (liniment for sores and poultice for swellings; poultice for skin abrasions), SHUSWAP (infusion for poison ivy rashes), SQUAXIN (poultice for sores), THOMPSON (decoction used for pimples, hand chapping, rashes and insect bites; infusion of powdered leaf and stem for skin issues; sores rubbed with leaves and roots; poultice of lower leaves to help heal cuts); UTE (poultice applied to bruises), WINNEBAGO (infusion used as wash for swellings), and the POMO (salve used to heal sores). The ABNAKI (decoction of whole plant), ALGONQUIN (infusion of the whole plant), CARRIER (decoction of whole plant aside from the roots), and CHEYENNE (infusion of the whole plant), CLALLAM (infusion of leaves), FLATHEAD (infusion of leaves), KLALLAM (decoction of leaves), MICMAC (decoction with milk), MIWOK (infusion of leaves and flowers), NITINAHT (decoction), OKANAGAN-COLVILLE (infusion of roots), PAIUTE (infusion/dried roots chewed), SAANICH (young leaves chewed and swallowed), THOMPSON (infusion of whole plant), YUKI (infusion of leaves and flowers), all used A. millefolium to treat colds. ALGONQUIN (leaves crushed and used as a snuff for headaches; decoction used to treat headaches), BLACKFOOT (infusion externally applied to treat stomach flu), CHEYENNE (flower and leaf infusion used to treat chest pain), CHIPPEWA (leaves steamed and inhaled to treat headaches), CREE (flower infusion compress used to treat headaches), GOSIUTE (infusion used to treat headaches), HESQUIATE (leaves chewed to treat miscellaneous internal pain), IROQUOIS (poultice applied and plant chewed to relieve nerve pain), LUMMI (flower decoction used for body aches), MENDOCINO (leaf and flower infusion taken for headaches), MIWOK (plant used fresh or dried for miscellaneous pain), OKANAGAN-COLVILLE (plant infusion used for headaches), PAIUTE (old men smelled the plant to treat their headaches). The ENGLISH used yarrow to relieve headache by placing a feathery leaf up one's nose to induce a nosebleed . In MEXICO, yarrow is used in folk remedies to treat inflammation, respiratory illnesses, liver complaints, and diabetes . In the BALKANS, yarrow has been traditionally used as a wound-healing plant . In PAKISTAN, the juices and infusion of yarrow is widely used to aid digestion, heal wounds, mitigate ear/toothache pain, and to treat tuberculosis . In western UKRAINE, yarrow has been used as a wound healer, treatment for dysentery, nosebleed stauncher, postpartum medicine, and pustule treatment (in ointment form) . In ALBANIA, A. millifolmum is used primarily as a blood-clotting, and cholesterol lowering medicine . In SERBIA, yarrow is used to treat stomach disorders/loss of appetite, coughs, cramps, and menstrual complains . In TURKEY, the dried flowers are eaten by children for 4-days to combat stomach upset and diarrhea . Yarrow was on the official United States Pharmacopoeia roster from 1860 - 1880 for use as a stimulating tonic . Areal parts of A. millefolium have yielded a novel (as of 2017) compound, dihydro-a-cyclogeranyl hexanoate, has shown antioxidant, anti-inflammatory, and antimicrobial potential against Escherichia coli (E. coli) . An ointment made of A. millefolium was shown to successfully treat bruising, swelling, and surgical wounds of women who recently gave birth for the first time in a double-blind clinical trial . Compounds isolated from the flowers of A. millefolium have been shown to have tumor suppressing activity in in vitro/cancerous cell lines . A hydroalcoholic extract of yarrow has exhibited in-vivo anti-diabetic effects in type-2 diabetic mice . Yarrow has been used in the divination rituals of the young and desperate to find their true loves for centuries. There are few a variations on the theme. So in a dream this night, I hope my true love will appear." When the lonely individual sauntered home- not speaking another word until the morning so-as to not ruin the incantation- she or he was to place the yarrow under their pillow at night in hopes of dreaming of his/her true love . Who my true love is to be,"
Double-flowered yarrow plants were once brought to weddings to ensure seven-years of love , which sounds a bit like a curse to me (what does that say about year number eight?). If my love love me, my nose will bleed now". If the lady's nose bled, GREAT; it looks like Duncan had been faithful after all. If her nose did not bleed, Duncan (now a known philanderer) was likely to receive a black eye... which he may treat with the very plant that led to it. The Smithsonian Institute found DNA evidence of yarrow from a 2,000 year old medicinal pill found upon an ancient Roman shipwreck . If you haven't read Iliad yet, you probably know Achilles for his solitary weakness: his vulnerable heel; what you may not know is that he was a gore-soaked psychopath who would sooner drag your naked corpse from a speeding chariot in front of your parents than sit around and chat with you about your pets. Achilles knew everything dealing with human blood (he probably brushed his teeth with it), so it comes as no shock that the warrior is credited with discovering yarrow's use in stopping blood from spewing out of a wound. To honor Achilles for discovering the antihemorrhagic properties of yarrow, the ancients (Pliny the Elder among them) called yarrow, achilleos  which most likely led to our modern genus name for the plant, Achillea. However, Pliny himself was a little confused as to the nature of Achilles' association with the plant. While Achilles has been honored in name, and was supposed to have been trained by the wise centaur/herbal doctor, Chiron, we can see that the mythology linking Achilles to yarrow is a bit more tenuous than other articles may have you believe. In some accounts, Achilles healed the wound he inflicted on an adversary, named Telephus (the son of Hercules), with yarrow in a freak display of mercy . In other accounts, after incurring the bad-will of Bacchus, Telephus tripped over a vine and was speared by Achilles after the fall; alarmed that wound would not heal, Telephus visited an oracle who told him that the yarrow plant would heal his wound. Instead of finding the plant, Telephus bargained with Achilles that he would lead him to Troy if he could cure his wound. Achilles scraped the rust from his spear, and from the rust yarrow grew. 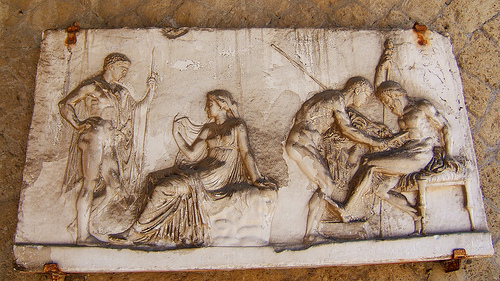 Achilles used the magically appearing plant to cure Telephus . This story makes no sense to me. While these accounts are most often touted by the yarrow-centric, the most widely recited version of this legend is that Achilles cured Telephus' wound using the rust shavings from his spear and nothing else    [so on]. Firstly, decoction/tincture/home-remedy making is hardly a standardized practice, and is by-no-means a safe substitute for seeking professional medical help for serious conditions (e.g. if you have an axe-wound, forget the yarrow and call 911). However, for relief from seasonal colds... why not? Cut up the amount of dried yarrow you would like to use. Weight the dried plant, and place it into a boiling pot. Multiply the weight of your dried herb by thirty-two (let's call this "your magic number"). Add the above weight in water to the boiling pot. Note: A U.S. gallon of water weighs approximately 8.34 lbs; a metric litre of water weighs approximately 1 kilogram. Bring the water and herb slowly to boil (allowing it to boil for 20-30 minutes) . Allow this to cool until warm. Add additional water until the weight of the decoction matches that of "your magic number." Drink a warm mug of your decoction, OR add it to your chicken noodle soup. Note: A U.S. gallon of water weighs approximately 8.34 lbs; a metric litre of water weighs approximately 1 kilogram. Please share your own remedies in the comments below. Readers of the I Ching, or, the Book of Changes (the oldest of canonical text of the Chinese) use yarrow stalks to divine messages due to random chance and numbers . The following link offers a tutorial of this method: link. Yarrow stalk divination has been traced back to around 1122 BC during the Chou Dynasty . In Roman-Catholic and Greek-Catholic churches of POLAND and UKRAINE, respectively, yarrow is a blessed plant used in Corpus Christi wreaths used to celebrate Assumption Day . This short movie is artfully hypnotic. Excerpt from Fyodor Dostoevsky's short story: Another Man's Wife . Pull Up Your Plants! (PUYP) is now receiving visits from all over the world! Please take the time to leave a comment or subscribe below. I’d like to hear about your experiences with yarrow.